Completely re-designed internally, the RCI-2980WX rack-mount style unit features a new 6 digit red LED readout, exceptional sound quality and large, easy-to-use controls. It offers AM-CW-FM-SSB modes of operation, variable power, superior noise filtering and built-in heavy duty AC power supply. 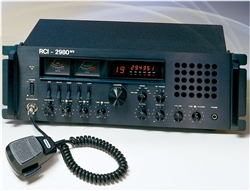 The RCI-2980WX has a full complement of front panel extra features, including large dual panel meters that display received signal strength, transmitter power output and antenna SWR. You will also find the clarifier has been expanded to include a separate coarse and fine tuning for above and below the selected frequency that provides the ability to precisely select the clearest signal for improved reception under difficult conditions. 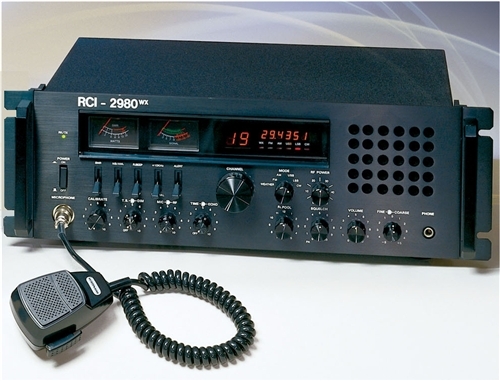 The RCI-2980WX delivers 25 watts PEP output power. The versatile and economical radio also features a rear panel frequency meter output for measuring transmit operating frequency. The RCI-2980WX now offers the ability to receive signals from your local NOAA Weather Channels insuring that you will have the coverage for your area. The unit will scan all 7 channels and lock in on the strongest signal. Also included is a NOAA Emergency Alert Tone to warn of impending severe weather warnings and conditions.